The Gigaset DX800A all in one is the professional multi-line desktop phone for small offices and home offices. 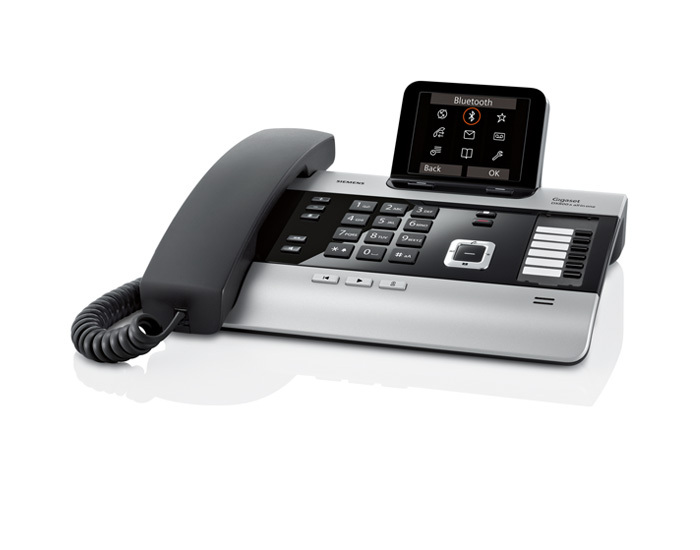 From its comfortably modern design to its large 3.5" TFT colour display, this corded desk phone has executive chic with business-like functionality to match. 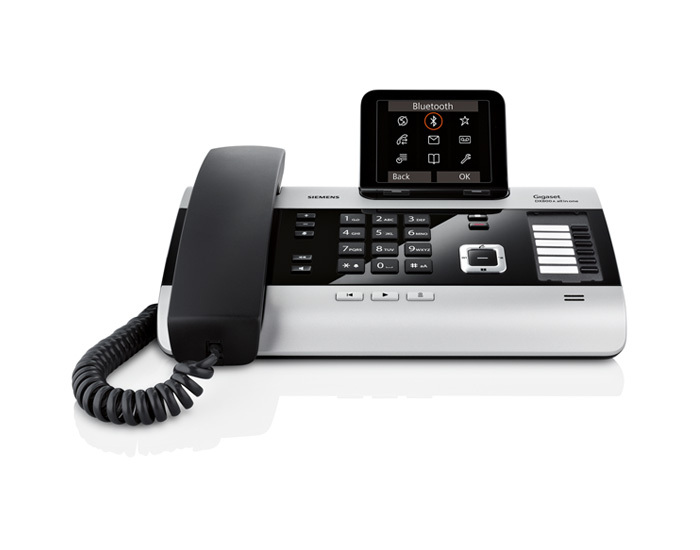 Being a hybrid phone means the Gigaset DX800A all in one is truly flexible and can be configured to either IP with ISDN (PTMP mode only), or IP with fixed line. 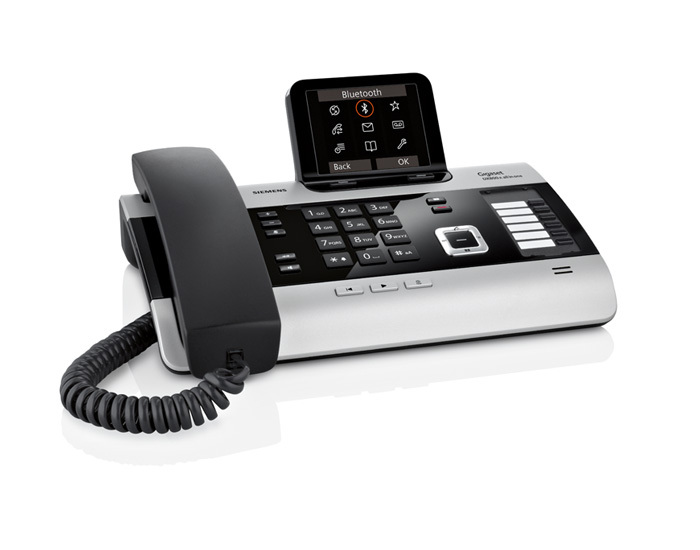 Being a multi-line telephone means it supports up to 4 calls in parallel; ideal for busy environments. 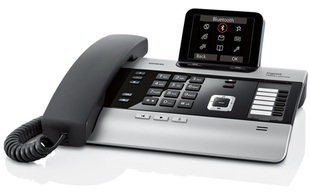 If you ever need to expand your horizons; the DX800A acts as a DECT base station with the ability to connect up to 6 handsets. 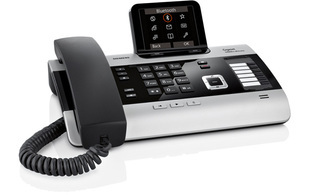 Connect up to 6 DECT handsets there is a wide choice of handsets from robust to luxury. 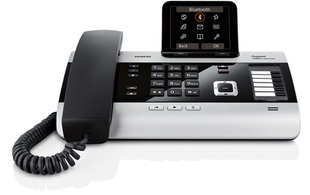 This means that this is a great business telephone solution for up to 7 users. 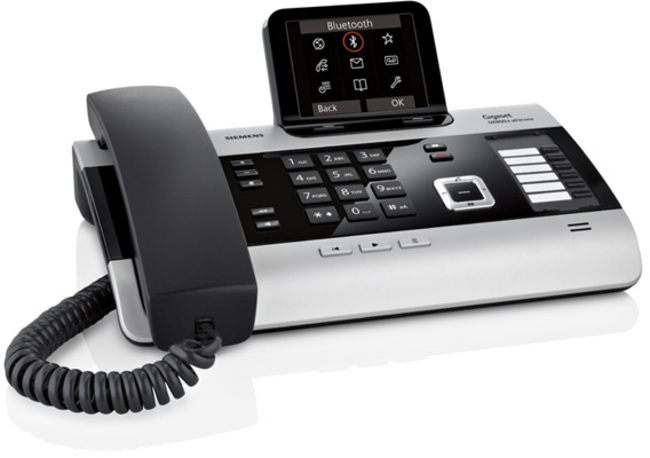 Up to 4 simultaneous calls making it ideal for busy environments (3 VoIP & 1 land-line, 2 VoIP & 2 ISDN (PTMP mode only) or 4 VoIP). 6 SIP accounts (this means that each DECT handset could have its own telephone number). Large 3.5" colour TFT display with intuitive user interface. HD quality sound that complies with Cat-IQ 1.0. Large address book with 1000 up to vCard store useful contact information including: first, last name, company, job title, 3 phone numbers, photo, email, website, address, birthday, notes and time zone. 3 Answer phones with up to 55 minutes of recording time means that people can always contact you, even if no one is free to answer the call. Professional finish this phone is professional inside and out, with a metallic finish. Call recording: if you are making an important phone call you can record it. The message saves in your answer phone list ready to play back when you need. Conference calling: the DX800A supports 3 way conference calls. E-mail: supports e-mail notifications (subject, heading, time & date, start of the message). Various screen saver options - pictures, logos, slide shows, clock and more. 6 memory keys for quick access to frequently dialled numbers. Link2mobileTM connection to mobile via Bluetooth® this means that you can make and receive calls via your mobile phone. Helping you make best use of your mobile contracts. Extend the DECT range by adding the RTX 4022 you can extend the DECT range (Up to 6 can be added).